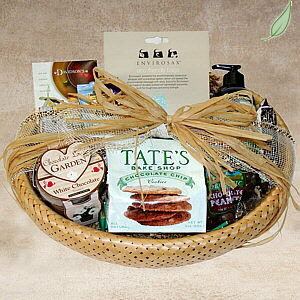 A bounty from Mother Earth designed to delight your mom or anyone else on your gift list. We've chosen organic and sustainable products that taste and smell good naturally. The delicious edibles that we assembled on the sustainable bamboo tray include Chewy's Rugulach (the best we have tried, and we've tried many), organic coffee and tea to drink with these treats, Tate's Chocolate Chip Cookies (they do taste bakery fresh, we have customers who order them by the case), Late July organic chocolate cookies, and Bread and Chocolate Bar Dark Chocolate Bar. On the gift side we have the lovely E.O. hand soap (all natural fragrance), colorful petunias to grow in a tin and our wonderful Envirosax. The Envirosax rolls up small enough to fit in your purse or glove compartment but holds loads of groceries and other goodies, it is indispensable. A thoughtful gift - for both the recipient and the earth.